Buckaroo Bonanza Bunch – Blue Creek Productions, Inc.
Great food and Great Hospitality and Relatively Funny Cowboys! 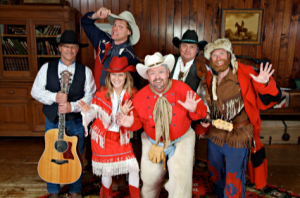 It’s a wonderful night for the entire family with great wild western entertainment with the “World Famous” Buckaroo Bonanza Bunch, a fun and exciting western show with great cowboy music. The night comes alive with a performance of wacky western fun featuring the “J. B. Tucker “Showman & The Buckaroo Bonanza Bunch” wild western theatre company in the style of Buffalo’ Bill’s great shows. This professional theatre troupe includes such characters as J.B. Tucker “Showman”, Jackrabbit Joe – “Mountain Man Extradonaire”, Sheriff Buckaroo Bob, and Sure Shot Shirley – Star of the Rodeo Circuit. Our show is fast moving, fun loving and filled with cowboy poetry, wacky western wisdom, mini western melodramas, fractured tales of the old west and cowboy music guaranteed to tickle the funny bone of audiences of all ages. J.B and his gang will keep the night a hoppin’ and Big Al, who heads up the house band, will fill the night with fun cowboy music and wild western oldies that will keep your toe a tappin’. So gather up your friends, the cows and the chickens and come on by for a roaring good time of wild western fun and excitement.